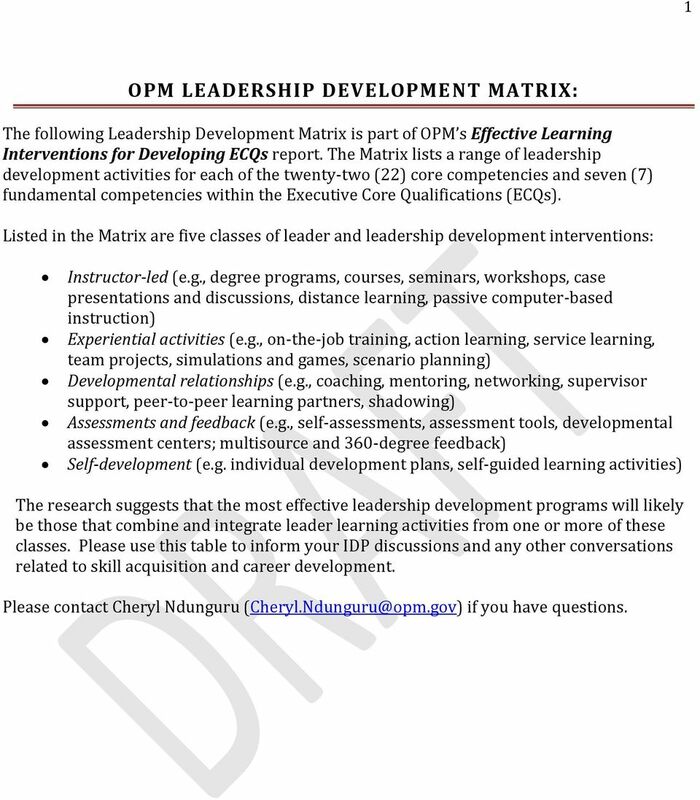 Download "OPM LEADERSHIP DEVELOPMENT MATRIX:"
1 1 OPM LEADERSHIP DEVELOPMENT MATRIX: The following Leadership Development Matrix is part of OPM s Effective Learning Interventions for Developing ECQs report. 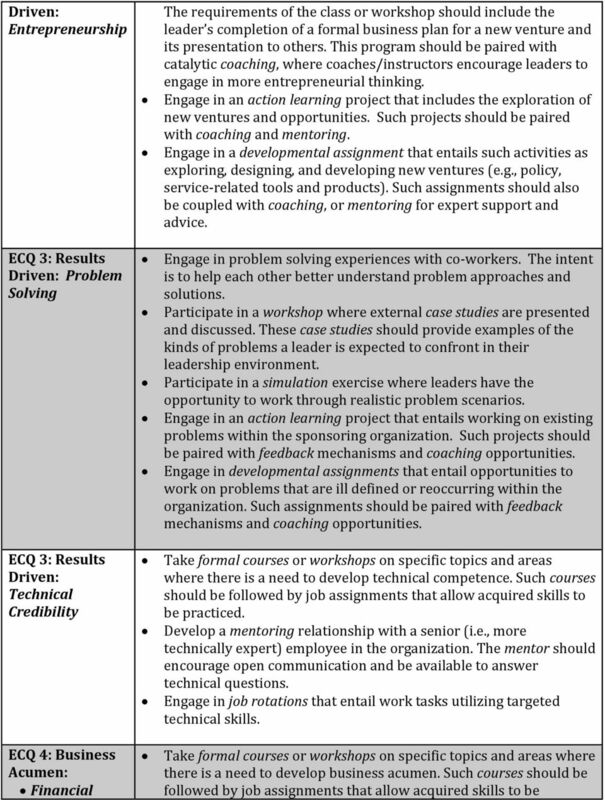 The Matrix lists a range of leadership development activities for each of the twenty-two (22) core competencies and seven (7) fundamental competencies within the Executive Core Qualifications (ECQs). 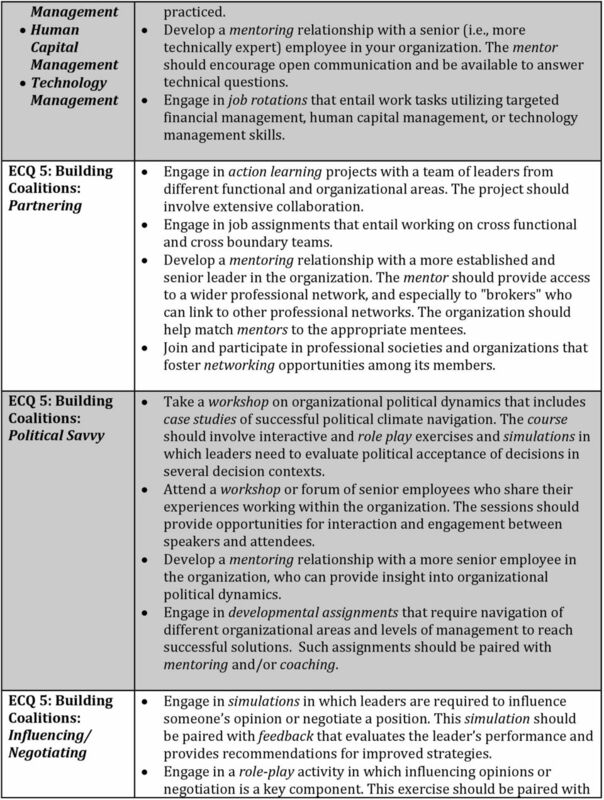 Listed in the Matrix are five classes of leader and leadership development interventions: Instructor-led (e.g., degree programs, courses, seminars, workshops, case presentations and discussions, distance learning, passive computer-based instruction) Experiential activities (e.g., on-the-job training, action learning, service learning, team projects, simulations and games, scenario planning) Developmental relationships (e.g., coaching, mentoring, networking, supervisor support, peer-to-peer learning partners, shadowing) Assessments and feedback (e.g., self-assessments, assessment tools, developmental assessment centers; multisource and 360-degree feedback) Self-development (e.g. 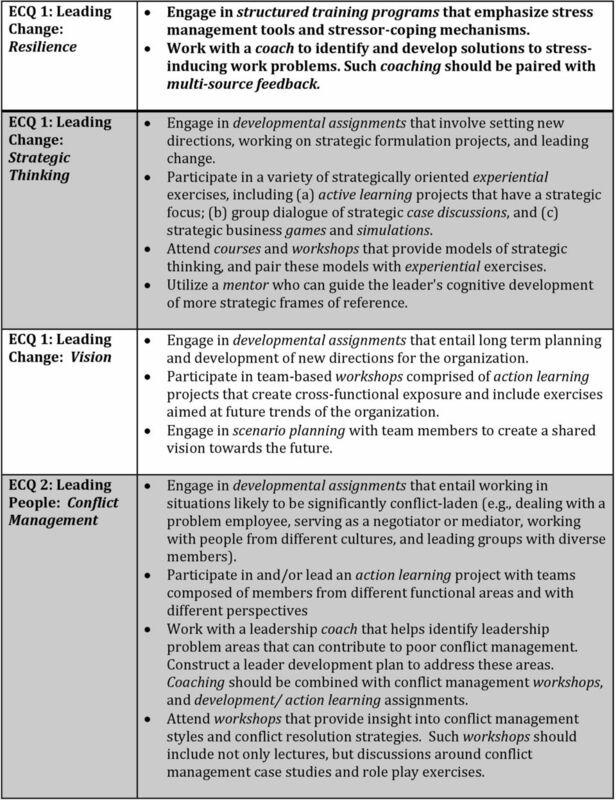 individual development plans, self-guided learning activities) The research suggests that the most effective leadership development programs will likely be those that combine and integrate leader learning activities from one or more of these classes. Please use this table to inform your IDP discussions and any other conversations related to skill acquisition and career development. Please contact Cheryl Ndunguru if you have questions. 2 Table 2. 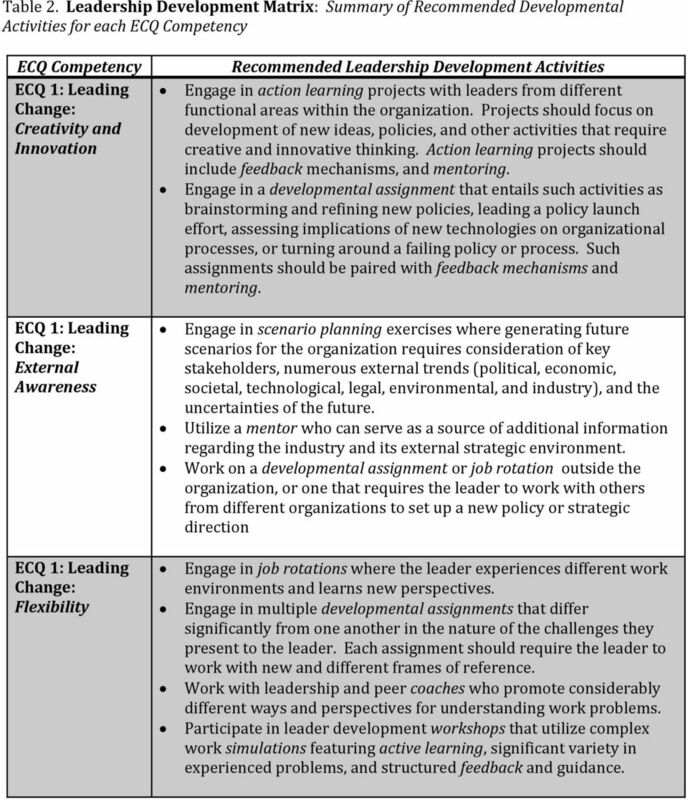 Leadership Development Matrix: Summary of Recommended Developmental Activities for each ECQ Competency ECQ Competency Creativity and Innovation External Awareness Flexibility Recommended Leadership Development Activities Engage in action learning projects with leaders from different functional areas within the organization. Projects should focus on development of new ideas, policies, and other activities that require creative and innovative thinking. Action learning projects should include feedback mechanisms, and mentoring. Engage in a developmental assignment that entails such activities as brainstorming and refining new policies, leading a policy launch effort, assessing implications of new technologies on organizational processes, or turning around a failing policy or process. Such assignments should be paired with feedback mechanisms and mentoring. Engage in scenario planning exercises where generating future scenarios for the organization requires consideration of key stakeholders, numerous external trends (political, economic, societal, technological, legal, environmental, and industry), and the uncertainties of the future. Utilize a mentor who can serve as a source of additional information regarding the industry and its external strategic environment. Work on a developmental assignment or job rotation outside the organization, or one that requires the leader to work with others from different organizations to set up a new policy or strategic direction Engage in job rotations where the leader experiences different work environments and learns new perspectives. Engage in multiple developmental assignments that differ significantly from one another in the nature of the challenges they present to the leader. Each assignment should require the leader to work with new and different frames of reference. Work with leadership and peer coaches who promote considerably different ways and perspectives for understanding work problems. Participate in leader development workshops that utilize complex work simulations featuring active learning, significant variety in experienced problems, and structured feedback and guidance. 3 Resilience Strategic Thinking Vision ECQ 2: Leading People: Conflict Management Engage in structured training programs that emphasize stress management tools and stressor-coping mechanisms. Work with a coach to identify and develop solutions to stressinducing work problems. Such coaching should be paired with multi-source feedback. Engage in developmental assignments that involve setting new directions, working on strategic formulation projects, and leading change. Participate in a variety of strategically oriented experiential exercises, including (a) active learning projects that have a strategic focus; (b) group dialogue of strategic case discussions, and (c) strategic business games and simulations. Attend courses and workshops that provide models of strategic thinking, and pair these models with experiential exercises. Utilize a mentor who can guide the leader's cognitive development of more strategic frames of reference. Engage in developmental assignments that entail long term planning and development of new directions for the organization. Participate in team-based workshops comprised of action learning projects that create cross-functional exposure and include exercises aimed at future trends of the organization. Engage in scenario planning with team members to create a shared vision towards the future. Engage in developmental assignments that entail working in situations likely to be significantly conflict-laden (e.g., dealing with a problem employee, serving as a negotiator or mediator, working with people from different cultures, and leading groups with diverse members). 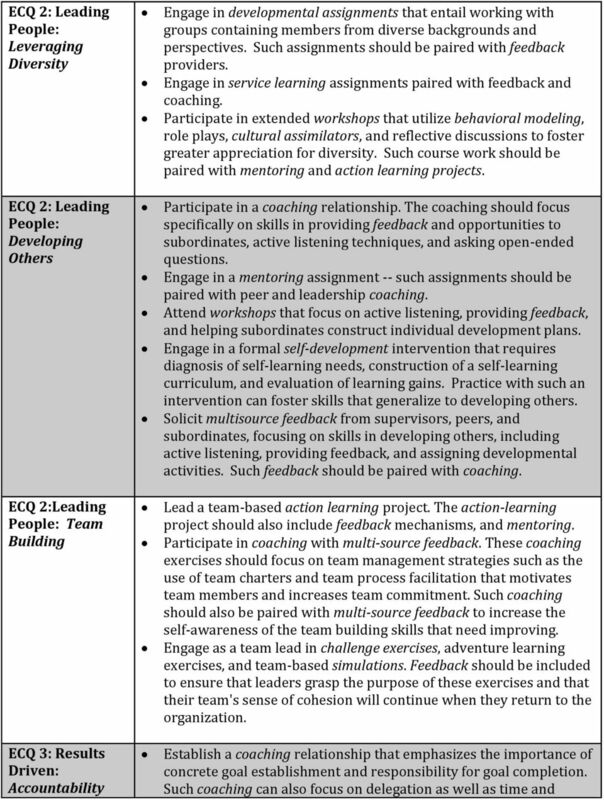 Participate in and/or lead an action learning project with teams composed of members from different functional areas and with different perspectives Work with a leadership coach that helps identify leadership problem areas that can contribute to poor conflict management. Construct a leader development plan to address these areas. Coaching should be combined with conflict management workshops, and development/ action learning assignments. Attend workshops that provide insight into conflict management styles and conflict resolution strategies. Such workshops should include not only lectures, but discussions around conflict management case studies and role play exercises. 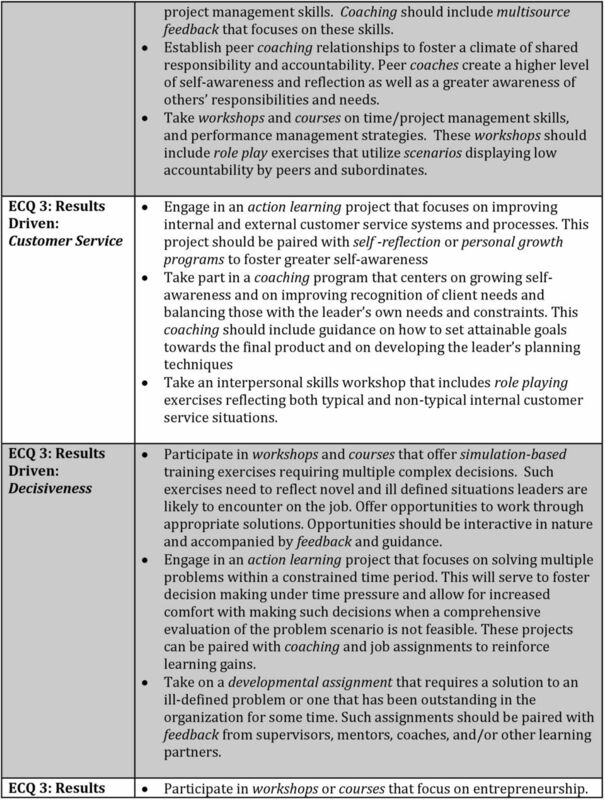 5 ECQ 3: Results Driven: Customer Service ECQ 3: Results Driven: Decisiveness project management skills. 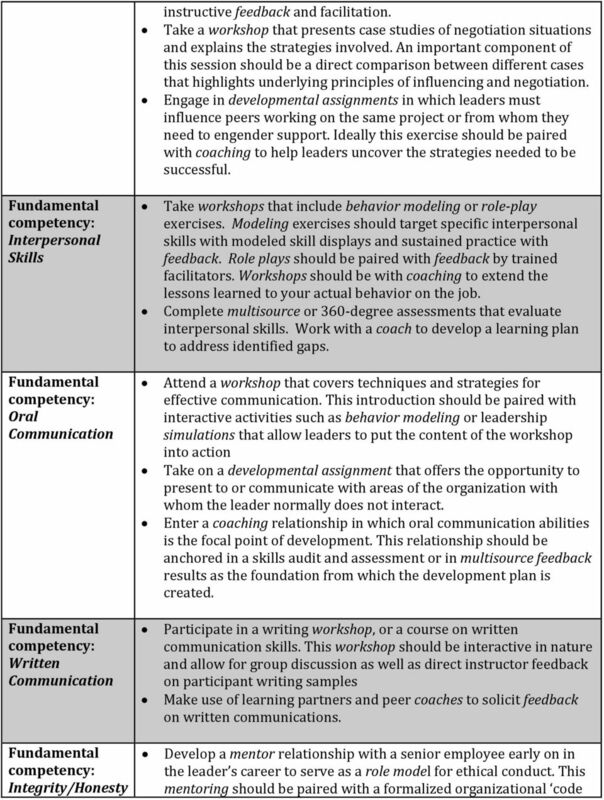 Coaching should include multisource feedback that focuses on these skills. Establish peer coaching relationships to foster a climate of shared responsibility and accountability. Peer coaches create a higher level of self-awareness and reflection as well as a greater awareness of others responsibilities and needs. Take workshops and courses on time/project management skills, and performance management strategies. These workshops should include role play exercises that utilize scenarios displaying low accountability by peers and subordinates. Engage in an action learning project that focuses on improving internal and external customer service systems and processes. This project should be paired with self -reflection or personal growth programs to foster greater self-awareness Take part in a coaching program that centers on growing selfawareness and on improving recognition of client needs and balancing those with the leader s own needs and constraints. This coaching should include guidance on how to set attainable goals towards the final product and on developing the leader s planning techniques Take an interpersonal skills workshop that includes role playing exercises reflecting both typical and non-typical internal customer service situations. Participate in workshops and courses that offer simulation-based training exercises requiring multiple complex decisions. Such exercises need to reflect novel and ill defined situations leaders are likely to encounter on the job. Offer opportunities to work through appropriate solutions. Opportunities should be interactive in nature and accompanied by feedback and guidance. Engage in an action learning project that focuses on solving multiple problems within a constrained time period. This will serve to foster decision making under time pressure and allow for increased comfort with making such decisions when a comprehensive evaluation of the problem scenario is not feasible. These projects can be paired with coaching and job assignments to reinforce learning gains. Take on a developmental assignment that requires a solution to an ill-defined problem or one that has been outstanding in the organization for some time. Such assignments should be paired with feedback from supervisors, mentors, coaches, and/or other learning partners. ECQ 3: Results Participate in workshops or courses that focus on entrepreneurship. 9 Fundamental Continual Learning Fundamental Public Service Motivation of ethics that clearly reinforces a climate of integrity. Attend a workshop that provides heuristical decision making tools for leaders to rely on in potentially challenging ethical situations on the job. These decision making tools will help guide appropriate action in times of uncertainty. Take a course or workshop that includes case-studies involving poor ethical conduct. 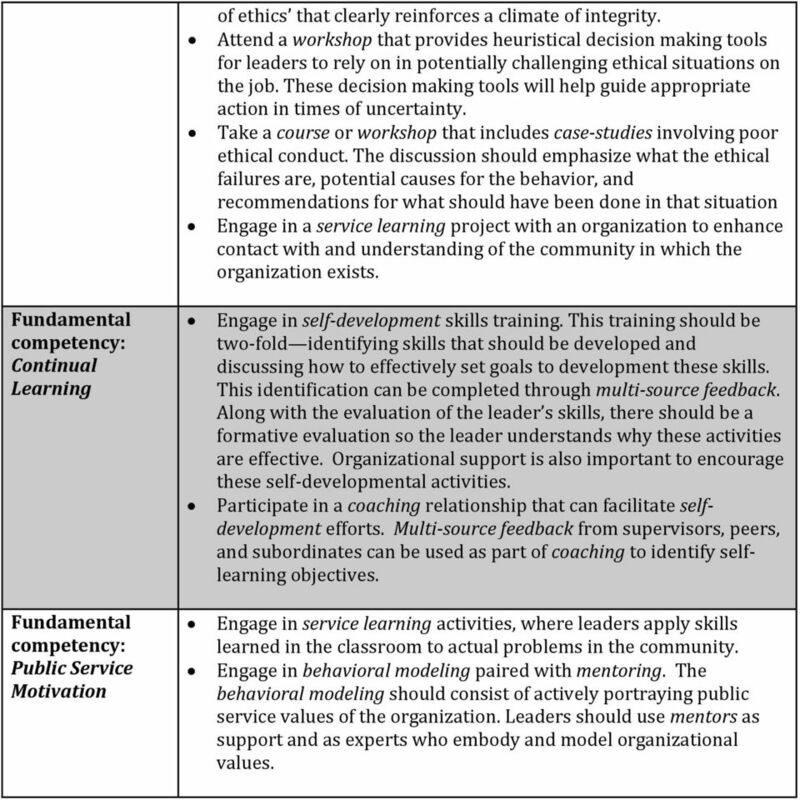 The discussion should emphasize what the ethical failures are, potential causes for the behavior, and recommendations for what should have been done in that situation Engage in a service learning project with an organization to enhance contact with and understanding of the community in which the organization exists. Engage in self-development skills training. This training should be two-fold identifying skills that should be developed and discussing how to effectively set goals to development these skills. This identification can be completed through multi-source feedback. Along with the evaluation of the leader s skills, there should be a formative evaluation so the leader understands why these activities are effective. Organizational support is also important to encourage these self-developmental activities. Participate in a coaching relationship that can facilitate selfdevelopment efforts. Multi-source feedback from supervisors, peers, and subordinates can be used as part of coaching to identify selflearning objectives. Engage in service learning activities, where leaders apply skills learned in the classroom to actual problems in the community. Engage in behavioral modeling paired with mentoring. The behavioral modeling should consist of actively portraying public service values of the organization. Leaders should use mentors as support and as experts who embody and model organizational values. HHS MENTORING PROGRAM Partnering for Excellence MENTORING PROGRAM GUIDE November 17, 2008 TABLE OF CONTENTS Page I. VISION STATEMENT.... 2 II. MISSION STATEMENT. 2 III. INTRODUCTION...2 IV. PROGRAM OBJECTIVES. State of Washington Guide to Developing Succession Programs Updated November 2008 Page 1 of 9 Introduction The purpose of succession planning is to develop a pool of internal candidates for future vacancies. SUCCESSION PLANNING and LEADERSHIP DEVELOPMENT TOOLKIT April 2015 CONTENTS 1 Succession planning 3 What is succession planning? Succession planning process Leadership development 4 What is leadership development? DIVERSITY Ongoing education is a defining element of Qualcomm s culture, reinforcing our belief that the overall capabilities of our organization increase as individual employee skills and knowledge improve. Sometimes there is confusion over what mentoring is, and what it is not. NAVSEA Leadership Development Continuum The Continuum allows employees to focus on leadership development through various stages of their careers, in preparation for future opportunities with the organization. 4.1 Describe the formal and informal performance appraisal processes used in the organization, including self-appraisal, peer review, and 360 o evaluation (as appropriate) for all levels in the organization. Would I Follow Me? An Introduction to Management Leadership in the Workplace This dynamic program clearly shows the right and wrong ways to deal with the very important human dimension of team performance.